Now here’s a cool idea! Ever find yourself wanting to carry an axe on you, but find the handle to which it is attached to be a burden? Or you want to cut up the snake that’s trying to eat your french poodle, but don’t want to get up close with a hatchet? Then of course you’re gonna want a beer after all that right? But don’t have a bottle opener! 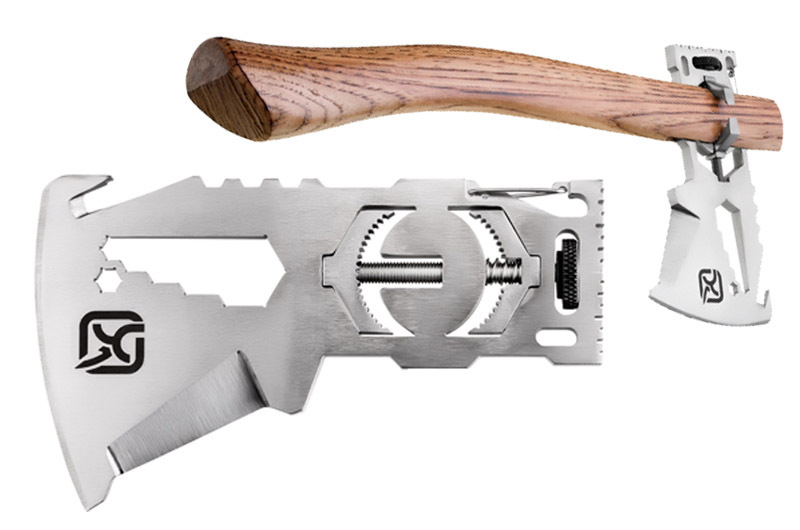 Then the KLAX multi-tool axe head might just be the thing for you! The top of the line model contains a bottle opener, ulu-knife, knife blade, gut hook, hex wrench set, lanyard hole, carabiner, ruler and apparently a 1/4 bit drive socket. Then there’s the clamping system; which allows you to attach the axe head to any old stick to use as a handle. So now you can fight of that snake with as long an axe handle as the bush allows, and open up that beer afterwards. The top model featured will set you back $160 US and is available for pre-order alongside a host of other models right now from Klecker Knives.